I mentioned some weeks ago that I may have a new hobby. What began as a curiosity based on some old military stoves my father owned when I was a kid has turned into regular searches on ebay for trashed-out stoves and lanterns and many evenings tinkering with my purchases in the garage. But, if I’m not building boats at the moment this seems like an interesting thing to do. 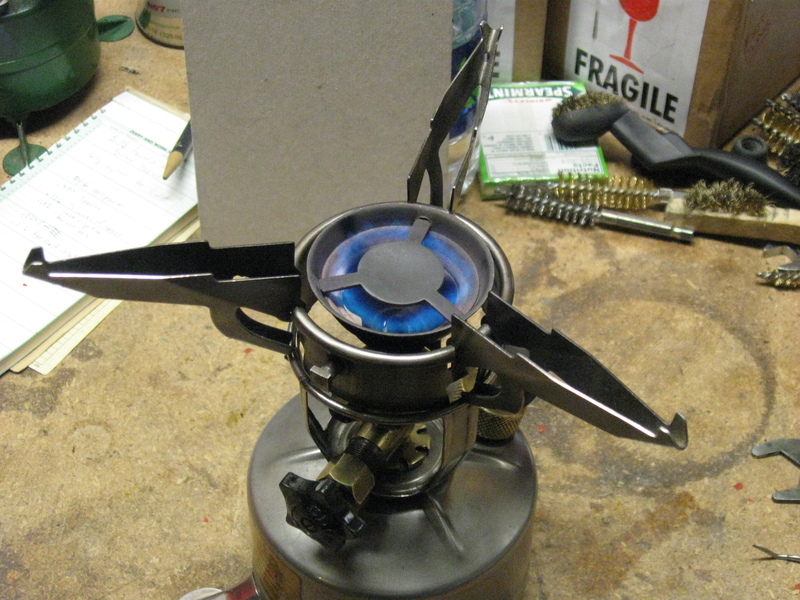 A month ago I purchased two Prentiss Waber M-1942-MOD(ified) “Mountain” Stoves. Both are dated, PW-1-45 (PW = Prestiss Waber). These stoves were made collectively, I believe, by Coleman, Prentiss Waber (a.k.a Preway) and Aladdin. When I received the first one, I was working on two other stoves, so I didn’t take a close look at it, but by the time I received the second one, and compared the two, it was obvious that someone had tinkered with it before. So, I completely disassembled it. In my opinion, as long as you don’t break anything, this is a good way to learn about its’ operation and helps identify where things can go wrong. I’ve always enjoyed this. One time, back in my early twenties, I bought a two-cylinder, two-cycle, model airplane engine just so I could take it apart to see first-hand how the fuel delivery worked with only one carburetor, and no poppet valves, etc. That was pretty neat. Anyway, I disassembled the stove and got to work on cleaning it up. For information about interchangeability of burner bowls, vaporizers and tip cleaners, please see my blog post on M1942 Vaporizers. Sometimes I ask ebay sellers for the year or manufacturer of a stove they’re selling and they reply that there isn’t one on the stove. Though Aladdin’s stamping is generally lighter that the others, I haven’t see one yet that doesn’t have it. These are all on the windscreen/pot support. Another identification feature is the fold-out feet. Each manufacturer made the feet slightly different. I bought a pair of stoves where someone swapped out the parts, but since the manufacturer is stamped in the windscreen/pot support and not in the frame I looked at lots of photos online to get the proper tank with the other parts. First, the pump. The pumps on these stoves are different than most other gas type stoves in that check valve (a.k.a. NRV) is built into the end to the removable pump tube, which also happens to be the same place you fill the tank with fuel. There are two styles of the NRV, which I didn’t know at the time. My first thought upon noticing this was that someone put in a homemade version of their own. But, I searched around the web and saw both styles on various forums. These little valves can be problematic if you don’t replace the rubber insert, as it dries out over time and allows fuel to back-up into the pump. Some people reported their stove catching fire because of this so I was certain to replace it right away. Another curious feature is that the pump itself is a storage tube for spare parts. Addded 27NOV2016 – With more experience I know now that the two NRVs in the photo below are the M1942 style (upper) and the M1950 style (lower). 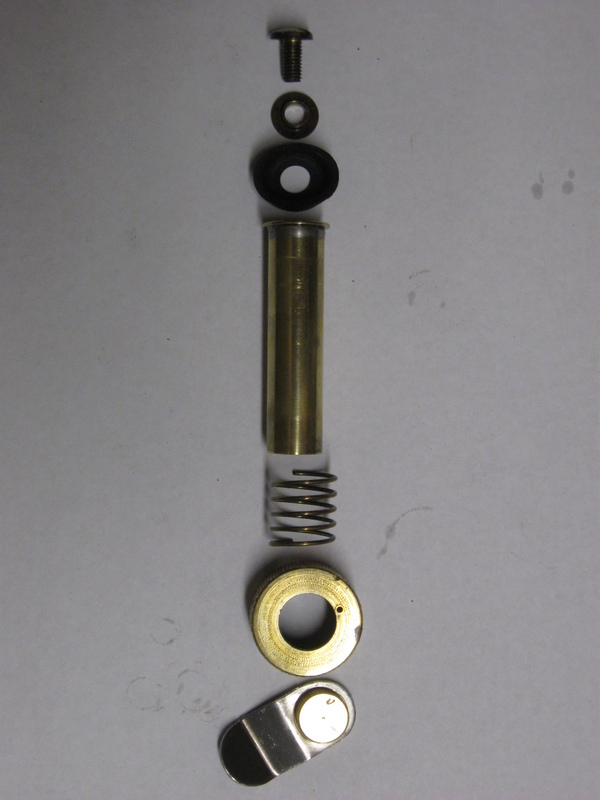 I’ve been using both, so if you cannot find a suitable replacement spring for the M1942 type, you can substitute an M1950 spring/cup/gasket successfully. See my blog post on M1942 and M1950 NRV gaskets for more information. I replaced the main On/Off valve graphite packing as it was also hard and they are relatively inexpensive and easy to replace, so why not change it now? I reassembled the valve and installed it in the tank (see Assembly Note below before installation). Then I gave it a pressure check to see if fuel leaked anywhere and it did. I do this by installing the valve assembly without the burner bowl and pot support, pressurize the tank, press my finger over the vaporizer and then open the valve. It appears that the compression ring (the silver disk) was not mating properly to the brass valve body. I tightened it plenty, but it just wouldn’t seal. I spent a lot of time looking for solutions and because I have two stoves was able to swap parts. If appears to be the mating surface of the valve body itself. The valve bodies do not have replacement parts available so I can’t just swap this part out with a new one. Meanwhile, I found that a little Permatex #2 will seal it for now (Note: since this time, I’ve purchased additional stoves, swapped parts between them and both sealed without needing any sealer 19MAR2016). Assembly Note: If you’ve removed the entire valve assembly, like I’ve done here, do not install the packing and valve stem/bushings before you install it in the stove. Here’s what to do: 1) install the valve stem/packing nut on the valve assembly and install the valve assembly using a deep-well socket and extension. The nut will help prevent damaging the threads and prevent bending the valve stem opening. I use Aviation Form-A-Gasket Sealant liquid (Item# 765-1210) on the tank threads as it was recommended by a Coleman repairman. Recall that proper clocking positions the valve stem opposite of the fuel fill opening. See photos later in this blog post if you’re not sure. And, remember to position the mounting post for the wrench on the pot-support/windscreen/frame above the main valve stem.When satisfied with the positioning, remove the nut. 2) place the small bushing on the valve stem with the beveled inside edge towards the wire which wraps around the valve stem. 3) install the packing, 4) install the large bushing, 5) insert into valve body, 6) thread the valve stem all the way closed, 6) install the valve stem/packing nut and tighten. Installing the tip cleaner parts, assuming you removed them. Typically, I wouldn’t remove these, however this stove’s tip cleaner packing was gone (as in, missing! ), so I needed to make one. Don’t remove it if it isn’t leaking. As far as I know, nobody has made them in 70 years! Well . . . except me, and I’ve made only a half-dozen and am still testing them. Here is what the full assembly looks like, though you cannot install it in the stove this way. I’m only showing it this way for clarity. The vaporizer/generator has a little screen which goes inside. These are almost always loaded with carbon and can be difficult to remove. I found a few places where I can get replacement screens and installed a new one. The tip cleaner needle goes through the middle of the screen so you need to be careful not to snag it when installing the vaporizer. 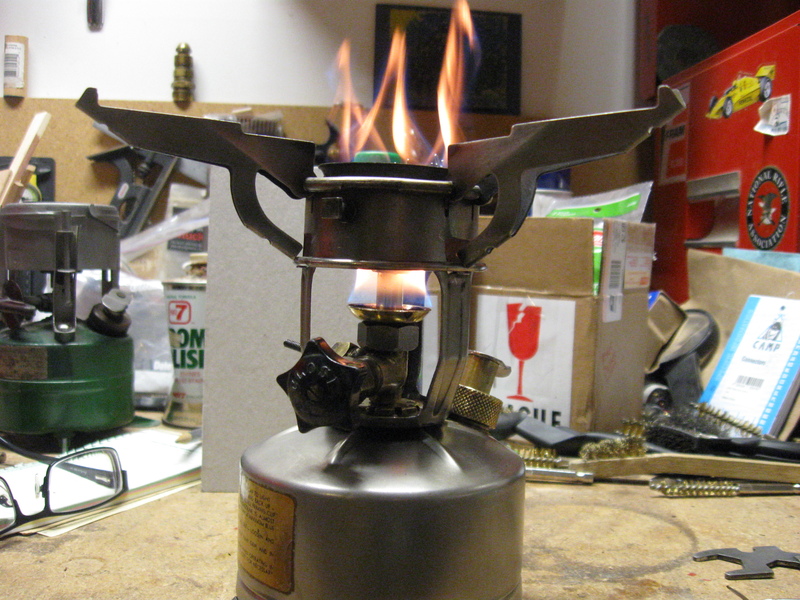 I finished re-assembling the stove and filled it with fuel, then gave it one more leak test. All good. 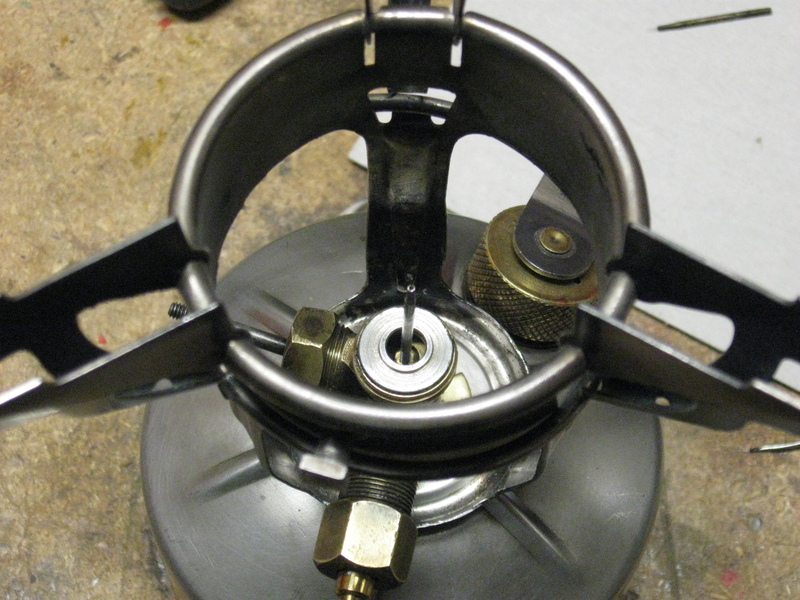 I re-installed the burner bowl, pumped it up and opened the fuel valve long enough to fill the pre-heat cup. A side thought. I always thought that MSR invented the preheat cup as this is a common feature on the Whisperlite and other MSR stoves, but apparently it was invented during World War II or possibly earlier. It is present on this stove, some Coleman 520s, the American (AGM) M1941, and the M1950 stove (which was manufactured up into the 1980s, I believe). Anyway, I lit the pre-heat cup, watched it burn, checking for any flames where they don’t belong, and with everything going properly, opened the main valve and got a nice blue flame. The second stove works without any maintenance other than a tank cleaning, new fuel cap gasket and new seal in the NRV valve. Now, I’ve got two working M-1942-MOD stoves and may just take one on a backpacking trip as these are very light little stoves. And, with that pre-heat cup, I’ll bet it lights-up nicely, high up, in the cool air of the mountains. Location of instruction labels (added 27NOV2016) – It seems that the three manufacturers didn’t place the labels in the same place on the stove (see photo of stoves with original instruction labels). Update for 19MAR2016: If you have questions about assembly or what something looks like which I’ve omitted, please add a comment. 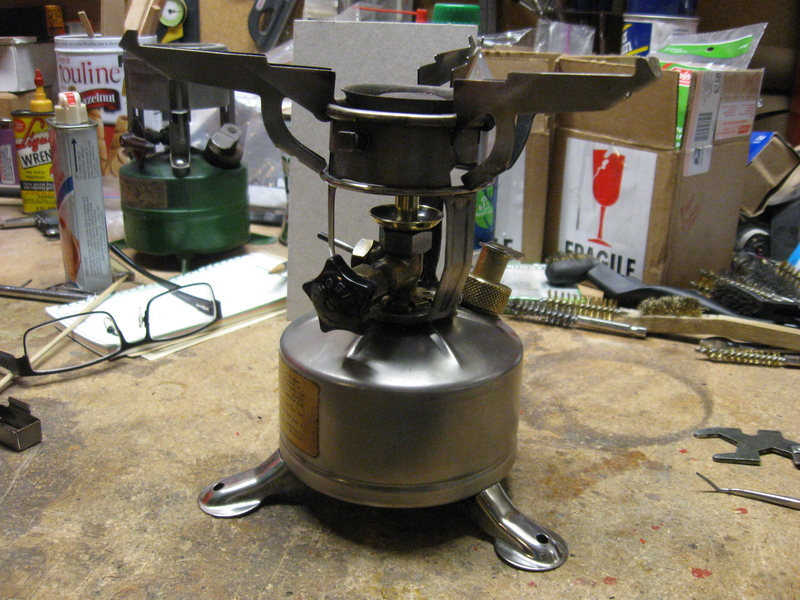 I’ve rebuilt 6 of these stoves (four PWs, one Coleman C-A and one Aladdin) to date and have lots of photos. This entry was posted in Backpacking, Colorado Life, Stoves and Lanterns and tagged Aladdin, Assembly, Backpacking, Coleman, Coleman Stove, identification, M-1942 Stove, Mountain Stove, Prentiss Waber, valves. Hi got a ?on m42 field stove, I got two myself and restored them both, but now I have gas going into the pump valve, is that supposed to be? Sorry for the late reply, I was out of town. Hello. Do you have any photos of the valve stem assembly with the packing and related parts? Nice looking stoves. I have a beater M1950 that works great and I’m hoping to find a 1942 at a flea market or garage sale. They really are. Except for the seals and knobs they’re stainless steel and brass, so they hold up really well. The last one I bought, I found in an antique mall for $18. It was still full of unleaded gasoline, the vaporizer was clogged and it needed new seals. After, cleaning it up, it’s the one I use regularly. Keep your eyes open and I’ll bet you find one. Some weeks ago I bouht a M1942 Stove in Ebay. When arrived to my address I could see that the burner bowl It was very run down,and my question is , where I can find a new burner bowl? I asked in oldcolemanparts.com but they haven’t. How bad is it? Send me a photo if possible. Since they are made of stainless steel and brass they are typically salvageable. I can think of two other solutions to your problem. The burner bowl used in the M1942 stove has three square holes in it so the pot support arms can pass through the burner bowl and fold up. After WWII, there were surplus items and/or old tooling available and on the M1950 stove, and only for Coleman, and only for the year 1951, surplus or old tooling burner bowls were used. I have two Coleman 1951, M1950 stoves and they both have the M1942 burner bowl. So, you could look around on ebay for a cheap stove just for the purpose of getting the correct burner bowl, then buy a standard round hole M1950 burner bowl from Old Coleman Parts and re-sell the 1951 M1950 stove. The second possibility is to buy the round hole M1950 burner bowl from Old Coleman Parts and cut the holes to the square shape to allow the pot support arms to fold away. Except for the square versus round holes, the two look the same. 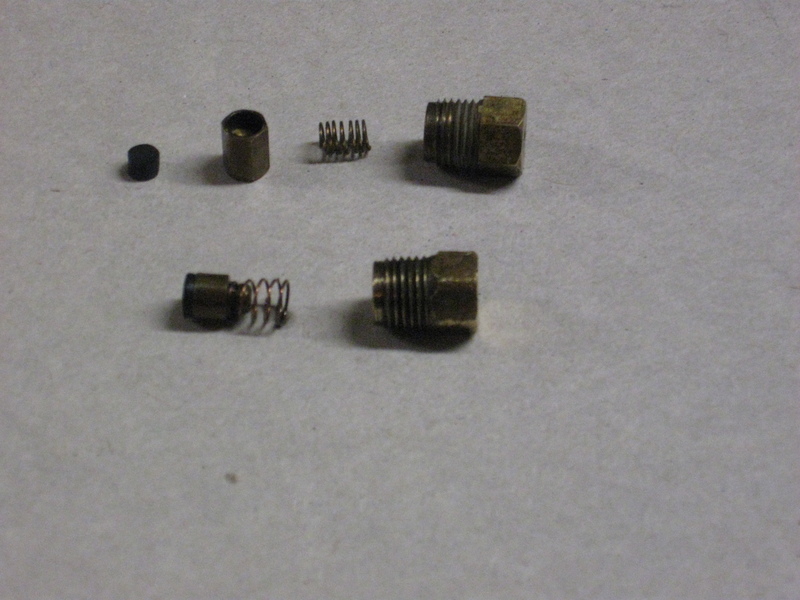 And the vaporizers used on M1950, M1942 and WWII 520 stoves are all the same so the threads will match. Let me know about the old one. Hi Jan, Thanks for the question. In response to your question, I wrote a new blog post here: https://sklcolorado.wordpress.com/2016/11/14/m1942-520m1941-and-m1950-vaporizers/ Take a look and see what you think. I can see why there is confusion. Steve, I really appreciate the time you’ve taken to document refurbishing these stoves. I’ve learned a lot, but do have a fairly fundamental question. I have a m1942 PW 1945, understand the pump mechanism well, and have gotten the burner bowl off, but unless my stove is just put together really tightly I can’t figure out how to get the main valve assemble separated from the tank. Appears to be a 3/4″ nit but it doesn’t budge, and the windscreen doesn’t leave you much room to work…help! Which gaskets? For the M-1942 MOD stove, if you are referring to the fuel cap/pump tube gasket and the air check gasket check out Old Coleman Parts. Which springs are you looking for? Hello, thanks for answer, ill check old coleman parts. looking for springs that closing getting fuel to air pump. Didnt find anywhere to buy original. Do i have to look around for non-original spring that works? Only spring i find is https://www.oldcolemanparts.com/product.php?productid=3636&cat=&page=1 but i have different number of screw-thread then mine only one works. The original size and shape spring for the air-check, also called check valve, will not likely be found. You will need to experiment to find a suitable replacement. Some people have had success using springs from ink pens. If you look at my post on pumps you will see that the M-1950 spring and cup will fit and work correctly. You could acquire one of those until you locate an original-style spring. Typically, I clean the tip by soaking it in denatured alcohol or in an ultrasonic cleaner, then, using a piece of an old vaporizer screen I roll it up to fit inside the vaporizer tip (not the wire hole) and twist it around to get any carbon removed. Then I use the current needle or an old needle and cycle it through the tip until it moves freely. You need to be careful not to bend the wire of course. What is the issue? If the stove doesn’t seem to have much power then the wire hole may need to be cleaned as you suggest. If the stove stops working shortly after start-up, and everything else is in good shape (pressure, etc. ), then you may have a tip cleaner with a wire which doesn’t retract completely. If interested, I can contact you via email and you can send me some photos. Thank you for the information and the pictures , after being burned 2x, due to leaking fuel and falling gaskets, I learned that white gas burns colorless on your hand till you realize it’s on fire, I’ll start over, and get this girl going. It’s personal now. But I do LOVE this little jem. I always wear a leather glove for the first lighting, just in case. Where is it leaking? What I do to remove the burner assembly from the tank is, 1) remove the burner bowl (make sure the pot support arms are up), then vaporizer by removing the spirit cup/nut. 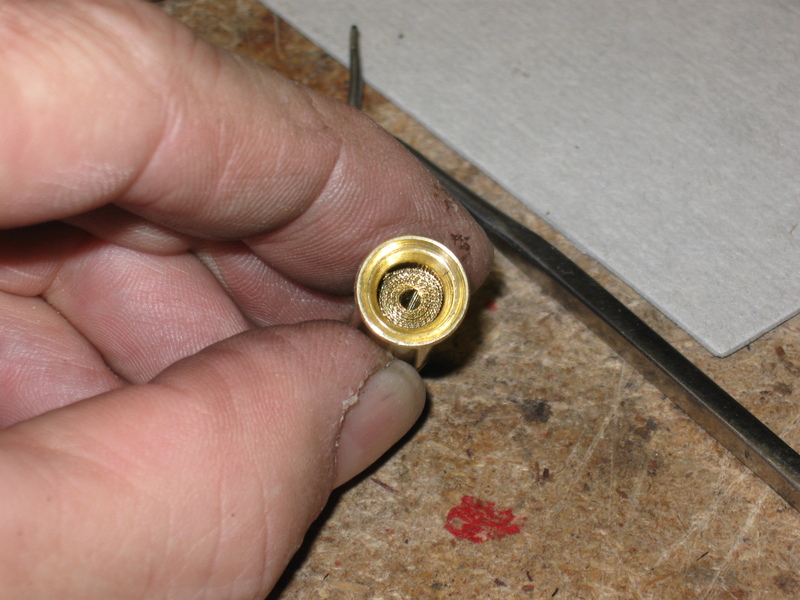 2) remove the tip cleaner (the piece with the wire for the vaporizer tip) it’s threaded into the valve assembly. 3) Loosen the lock ring at the base of the valve body which holds the windscreen/pot support tight, and finally 4) using a deep-well socket with extension, place it over the valve stem nut and slide it on as far as it will go, have someone hold the tank and remove the valve body. I typically remove the valve stem and place the nut back on there for strength and reduce the chance for damaging the threads. Let me know if you have other questions or if a photo will make it more clear. You can also check out my M1950 stove post and the 275 lantern post for the similar technique. Thanks for that. The stove is up and running and no leaks. It windy buttried outside in lee ofwall. Seems to be firing up ok after pre burn but kept going out . Poss due to wind or any suggestions? What are you trying between the time it goes out and re-lighting? Try opening the fuel cap to see if there is still pressure, because sometimes the pump is not pumping as strong as you might expect. Second, try cycling the tip-cleaner lever to see if some particles are getting stuck in the vaporizer tip.